Slotastic Casino was founded in 2009 by Orange Consultants Ltd, licensed in the Netherlands Antilles by the Government of Curacao. Players can play via browser or download the Real Time Gaming (RTG) software client. Currently U.S. players are not accepted at Slotastic Casino. Over 300 games are on offer at Slotastic, including table games, slots, video poker and progressive jackpot games such as Aztec’s Millions and Cleopatra Slots. Cumulative jackpot prizepools reach seven figures. 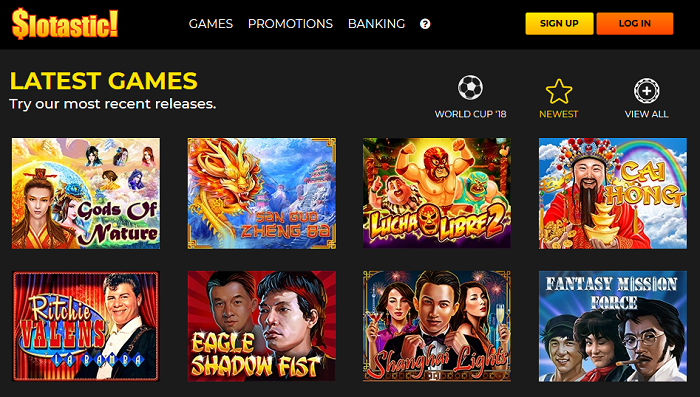 Try out the games with the latest Slotastic Casino bonus code and a minimum deposit of just $5. Slotastic Casino is audited by accredited testing facility Technical Systems Testing (TST). A full report on the integrity of their random number generator (RNG) is publicly available to view by clicking the TST logo on Slotastic’s homepage in the footer. Players’ personal details and transactions are safeguarded by SSL digital encryption. Players can also follow the CDS (Central Dispute System) link on the homepage to begin investigations into anything they find amiss, or contact 24/7 support tollfree. Slotastic Online Casino was reviewed by the team of FindCasinoBonus.com and earned a rating of 75/100.